Up to UPF50+ Sun-protective clothing. Get out there and enjoy the sun without taking risks. 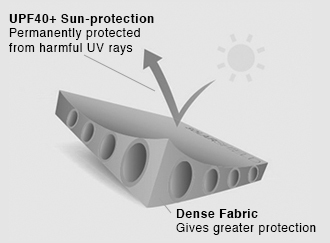 Our SolarShield fabric technology has been tried and tested to give you UPF50+ protection from harmful UV rays. SolarShield is Craghoppers’ range of permanent sun-protective fabric tested for UV-protection UPF40+.